United Nations Secretary-General Ban Ki-moon has called for an immediate halt to the missile attacks fired by Gaza terrorists at Israel. Ban spoke with reporters Wednesday in the Palestinian Authority capital of Ramallah after meeting with PA Chairman and Fatah leader Mahmoud Abbas and PA Foreign Minister Riyad al-Malki. 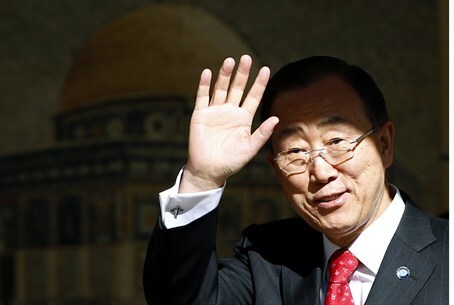 The U.N. chief met Tuesday with Egyptian President Mohammed Morsi at the presidential palace in Cairo. Moments after Ban issued his statement, a bomb exploded on a public bus in the center of Israel's largest population center, the city of Tel Aviv, on King Saul Street. At least 17 people were wounded in the blast, three seriously, when a “hefetz hashud” – an abandoned bag that turned out to contain a bomb – exploded on the Dan line. The wounded were rushed to Ichilov Medical Center by first responders from the Magen David Adom emergency medical service and ZAKA organization. Numerous others suffered symptoms of trauma and anxiety. The hospital has opened an emergency information number for those who are concerned they may have had a loved one involved in the attack: dial 125-5133 from any phone in Israel. Reports of a second bombing attack in Tel Aviv proved false. Rocket fire meanwhile continues to rain down on southern Israeli cities and towns as well. More than one million residents are essentially being held hostage by the rocket fire. Israelis are unable to carry out normal life activities because they are forced to remain within seconds of reaching a bomb shelter at all times. Israeli fighter pilots are continuing their surgical strikes as part of the Pillar of Defense counter terror offensive against terrorist targets in Gaza, while trying to avoid civilian casualties, even as PA Arabs in the region gather in mosques to bless the terrorist who carried out the attack in Tel Aviv, according to local media reports.